Final numbers are yet to be confirmed but pre-registration figures, evidence of initial attendance, the interest in the conference sessions, short courses and workshops and activity on the show floor bode well for European Microwave Week that took place at the Nürnberg Convention Center from 8 to 13 October being another record breaker. Read this full review of the event. As the premier RF and microwave event in Europe, EuMW 2015 attracted about 1,400 conference delegates and 4,200 unique attendees with the exhibition featuring 303 companies. MWJ editors have compiled a comprehensive summary of the event, including links to pictures and videos. 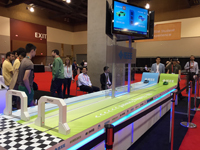 The most prevalent theme throughout IMS 2015 in Phoenix, Ariz. was the future development of the Internet of Things (IoT), including applications such as wearable technology, connected medical devices, vehicle-to-vehicle communications and machine-to-machine communications. Here is a full review of the products from companies participating in the exhibition. European Microwave Week attendees have said Arrivederci Roma after the event was staged in the Eternal City from 5 to 10 October. During the week all roads, train tracks, bus routes and flight paths led to the Fiera di Roma, which played host to the three conferences: the 44th European Microwave Conference (EuMC), the 9th European Microwave Integrated Circuits Conference (EuMIC) and the 11th European Radar Conference (EuRAD), together with the European Microwave Exhibition and affiliated workshops and short courses. Meet Experts, Make Friends was the motto for the 16th European Microwave Week that found a new home at the Nürnberg Convention Centre, NCC Ost from Sunday 6th to Friday 11th October. A higher number of unique delegates, along with exhibitors and visitors were able to discover that the beautiful city combines the culture, entertainment and history of a large metropolis, while affording the charm and warmth of a much smaller city. Whether in the conference sessions, workshops and short courses, on the exhibition floor or socialising at the Welcome Reception there was the opportunity to foster relationships, both professional and personal. This is a complete show summary.